Many patients suffer complications, concurrent illness, recurrent disease, and generalized debilitation following major gastroduodenal surgery. Some of these problems represent the inherent risk of operation to relieve the original symptoms. 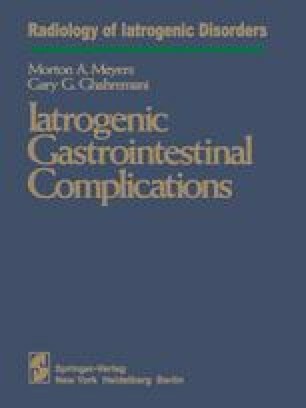 It is difficult, however, to clearly define the iatrogenic complications because surgical procedures are initiated by physicians, and thus any subsequently encountered problem may be technically considered iatrogenic in nature. In this chapter we will review those complications that may be created by and related to specific surgical procedures but that do not necessarily imply error in technique. Problems directly due to surgical oversights will also be discussed and the postsurgical radiographic anatomy of the upper gastrointestinal tract presented with emphasis on findings that may simulate other diseases.